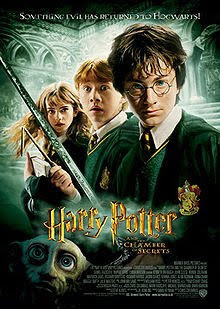 Harry Potter and the Chamber of Secrets (2002) is the second movie of the Harry Potter series. Synopsis from IMDb: Forced to spend his summer holidays with his muggle relations, Harry Potter gets a real shock when he gets a surprise visitor - Dobby the house-elf, who warns Harry Potter against returning to Hogwarts, for terrible things are going to happen. Harry decides to ignore Dobby's warning and continues with his pre-arranged schedule. But, at Hogwarts, strange and terrible things are indeed happening. Harry is suddenly hearing mysterious voices from inside the walls, muggle-born students are being attacked, and a message scrawled on the wall in blood puts everyone on his/her guard - "The Chamber Of Secrets Has Been Opened. Enemies Of The Heir, Beware". I haven't watched any of the Harry Potter movies. Harry Potter and the Chamber of Secrets is the first movie that gives me the foretaste of what a Harry Potter movie is about. Overall, I don't quite understand the storyline because first, my knowledge about everything related to Harry Potter is limited and second, I'm not used to British accent.